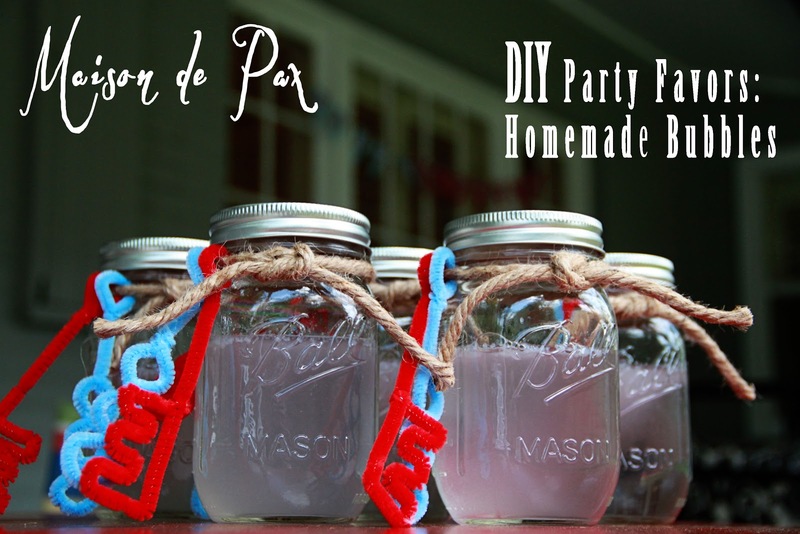 As I mentioned in this post, I’ve been in preparation for Littler Pax’s first birthday party. I promise to give more info on that soon, but I wanted to share a party favor with you all first. I found a cup that was the same size as the indentation on the mason jar lids and I traced it to create circles of chalkboard contact paper. Then I used pipe cleaners to shape an E (his first initial) and some circles (for easier bubbles). Slap that contact paper circle on the lid; tie the pipe cleaners around the top with twine, and write a name with the chalk marker. Simple! Just so you know, the pipe cleaners make awesome bubble wands (I was skeptical, so I had to try it out! ), but they are a little bit messy as they will drip solution… Just be ready for it! How about you? 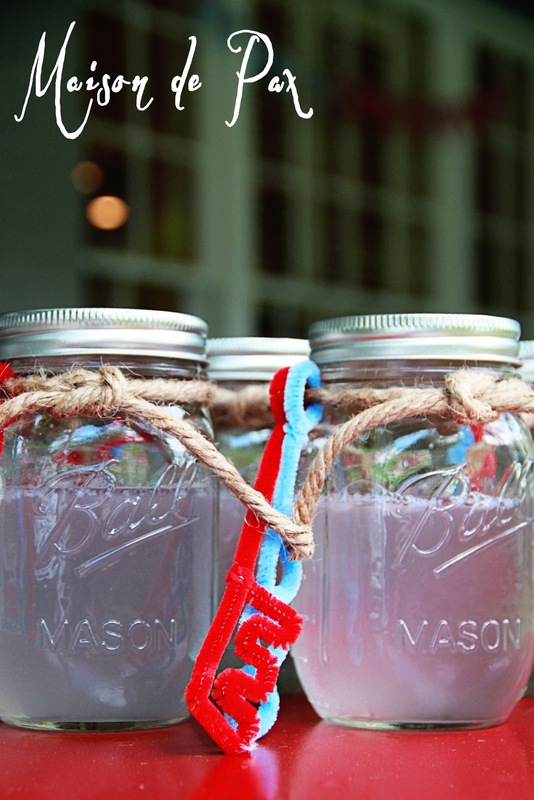 Do you have any great non-candy party favor ideas? Wow! What a really cute idea. I just did mason jar lids for my daughter’s birthday. I had never thought of doing bubbles or chalk paper like that. Fun! 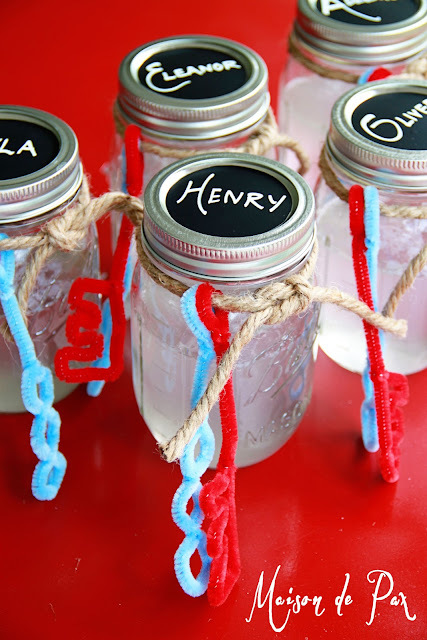 I love that you used pipe cleaners for the bubble wands, what a great party favour! What a great idea. Your mason jar bubbles are too cute! Stopping by from Savvy Southern Style. So glad you liked it, Diana! Come back any time!! Oh my gosh this is adorable! Thanks for linking this up to Give Me The Goods Monday! Very cute! I would never have thought pipe cleaners would work. Thank you for sharing it at to What We Accomplished Wednesdays. Have a lovely week! Thank you for hosting such a great party, Deborah! Such a cute idea. 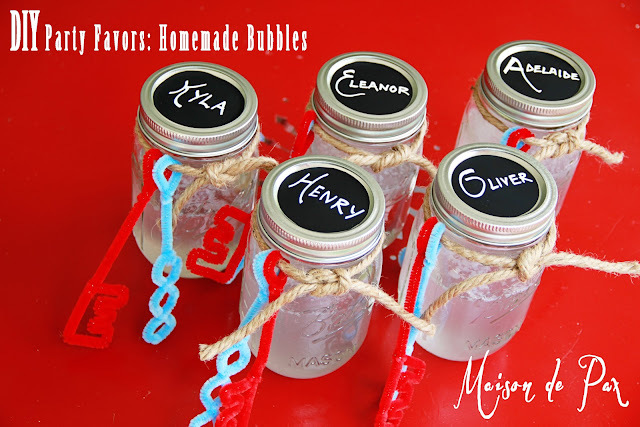 I have made the bubbles before for a family reunion, but I love how you put them in the mason jars and decorated them so cute. Thanks for sharing with SYC.